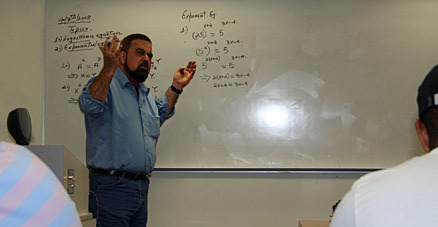 Since 1983 students have enrolled in Barry University’s Pre-Engineering Program. Pre-Engineering students take their courses in sciences and humanities at Barry before transferring to an accredited School of Engineering. After transferring, and depending on the School of Engineering chosen, some additional prerequisite coursework may be needed. Each pre-Engineering student usually takes at least sixty credits at Barry, and is assisted by an academic advisor in the selection of an appropriate program of study, in the choice of a school of engineering, as well as the transfer process. MAT 211 Calculus I 4 cr. MAT 212 Calculus II 4 cr. ENG 111 English Compos. 3 cr. CS 231Computer Sci. I 4 cr. PHY 211 University Physics I 4 cr. ENG 210 Introduction to Literature 3 cr. Distribution, CHE 3-4 cr. PHY 212 University Physics II 4 cr. Total: 14-15 cr. Total: 18 cr. MAT 213 Calculus III 4 cr. MAT 314 Differential Eqns. 3 cr. PHY 300+ 3 cr. MAT 356 Statistics for Science 3 cr. CS 232 Computer Sci. II 4 cr. CS or Science electives 6 cr. Distribution or electives 4 cr. Distribution or electives 3 cr. Total: 15 cr. Total: 15 cr. Early in the program, pre-engineering students are encouraged to contact specific engineering schools to inquire about special requirements that must be met prior to transfer. As an example, Mechanical Engineering may require additional Physics or CS courses; Chemical Engineering may require chemistry courses; Biomedical and Environmental Engineering may require biology, anatomy, zoology, or botany. Admission into an Engineering School is highly competitive. Barry has an excellent record of placing pre-engineering students who, after completing just two years of study at Barry, have been admitted into top engineering schools such as Johns Hopkins, Stanford and many others.